Easiest/most effective method to shake small e-liquid bottles? Shaking it obviously–but the lazy side of me wants a faster/easier method since I mix a ton of various tester-sized bottles (5mL, 10mL, and 15mL - glass and plastic). I’m wondering if anyone has any solid methods? I’d love to get one of those vibrating vortex mixers, but they’re pretty expensive ($100-$200). I can’t use a frother because the mouth of my glass bottles are too narrow, I can’t fit the frother in. 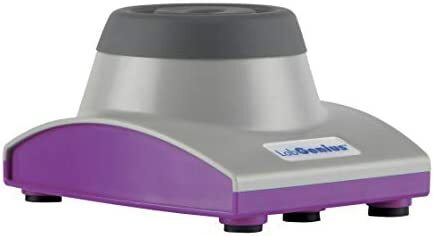 I don’t want to use a magnetic stirrer because it seems like a mess… Putting the bar into the bottle, using a tweezer to take it out, rinse the bar and the tweezers, do another bottle, etc. I see how this would be effective with large single flavor batches, but I’m using really small tester bottles. I bought a rubberized claw (to hold the bottle) connected to a metal rod and used a pretty powerful drill to spin the bottle… That didn’t work. I don’t like ultrasonic cleaners. They imo dissipate top notes because of the heat, and give the bottles/caps a weird smell. So I don’t know what to do at this point, any tips? Well I’ll be basing this on my own experience and maybe for others it’s different. I have a couple mini vortex mixers and they do absolutely nothing. 2-5ml won’t be enough liquid for this even too work, 8-12ml if it’s not too viscous does work a little. You get more bubbles into the mix by just shaking unless you let the bottle a couple minutes stand on the mixer. Above that amount nothing will move unless you are putting a “object” into the bottle, for example the little metal balls you can get for nail polish and acrylic paint. But if you’re doing that, then you will have the same “messy” clean up as you would with a stirrer. By now I am using these mixers just for that… shaking my nail polishes. I personally do use a stirrer even for 2ml mixes and yes it’s overkill but I don’t do that with every mix. I use the stirrer when working on recipes and profiles not when mixing my weekly/monthly supply/recipes, because what people seem to forget is, these stirrers don’t work in 2 minutes. Takes longer to run one mix on a stirrer in comparison to just shaking 10 bottles by hand. I personally never found it messy but then again I do mix in closed flasks and beakers never in the actual glass/plastic bottle. To be quite honest with you, shaking is the quicker method and less “messy” without cleanup in your case. Trust me when I tell you, using a mixer/stirrer/frother/whatever else applies here, is more work then just shaking the bottle. If you personally feel that this is too much work and you’re too lazy, I don’t think there’s any method that could help you out here lol. Id lose respect if i told ya i stick plastic ones in a zip lock w/ a sock to pad it and throw it in the dryer for 20mins, fluff cycle no heat, for 20 mins so i wont tell ya. I used to go to a shop that had the VG/PG/nic in one bottle and they had the shots in separate bottles. They would put the shot in the pre mix and put it on one of these for several minutes. The Vape shop by me uses one of those for shaking custom juices. Yes I was tempted after having to shake 40 test bottles at 1 time. That dosnt happen enough for me to get one. If im lasy… I’ll get all my 10ml syringes, make sure the needles are attached strongly and plugger the jucie back and forth in and out of the syringe. It works with no extra expense or sore arm syndrome. @lambu That is a good idea. If my dremel wan’t loaded with saw dust and metal flakes. I’ve fashioned a small frother/mixer out of a piece of twisted 22g SS316. Inserted into one end of a well-cleaned ink tube from a ball point pen. The other end is attached to a little DC motor wired to a USB connector. Ghetto as hell but works flawlessly for 15ml - 30ml bottles. Edited to mention with the SS316 you can make the stirrer small enough to fit those 10ml openings. But that’s just overkill IMHO. Mades me upset I threw out my electric tooth-brush I know i could have rigged that puppy up for this kind of work. Then mix with a small paint mixer/milk frother, and then transfer from the beakers to your bottle. No funnels needed. Easy cleanup, easy mixing, and perfect for SFT. I’m almost done testing my 300+ flavors since I started doing it this way. I use a sawzall and stainless steel plumbing clamps. Takes me no time to super shake on my mix days. I typically mix 12-25 10/15/30ml bottles. Super simple, super cheap… Put all the bottles in a gallon zip lock, roll the extra bag up so the bottles are tight next to each other and not clanking around, and shake the bag. I also mix 5ml, 10ml at a time. I can fit 20-40 bottles in a gallon bag. If I only mix 4 or 5 bottles, more often the case, I just roll the bag tighter. but the lazy side of me wants a faster/easier method since I mix a ton of various tester-sized bottles (5mL, 10mL, and 15mL - glass and plastic). I’m wondering if anyone has any solid methods? The thin attachment easily fits into the neck of any bottle I have. While I’ve gone back to mainly just shaking a mix my step daughter is lost without this mixer for frothing mixes. Interesting. Would it work well on a 70vg/30pg mix? It’s what alot of people here started with, yes. I haven’t tried this but i read somewhere that a mixer mixed various 30ml bottles for different customers, and the solution was to buy a 1 gallon paint mixing machine and load the bottles into a new 1 gallon can packed tight with rags. The can would be left sealed for steeping and shaken as needed until it was ready. I’m going to use a small frother. 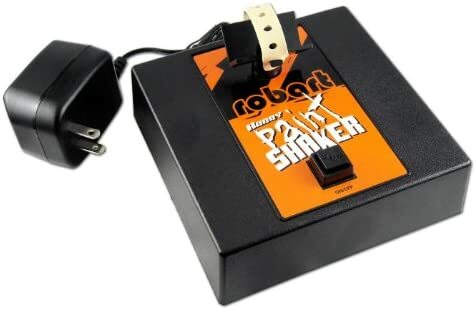 I had two of these paint shakers before and unfortunately the motor will burn out and very quickly. You can make your own as my next door neighbor helped me find a small motor in this quack of a town. The unit will actually just start to jump and it seemed to be in a stuck stage of sorts. Motor was just shot. Frothers are cheap and they will last 10x’s longer than this. Some I’m seeing use jewelry cleaners for a few minutes to bind the ingredients as well. Seems to help with the steeping process more too! I hope this helped out and wished there was another unit like this. I bought two for doing nails with gel nail polish which were not heavy bottles.